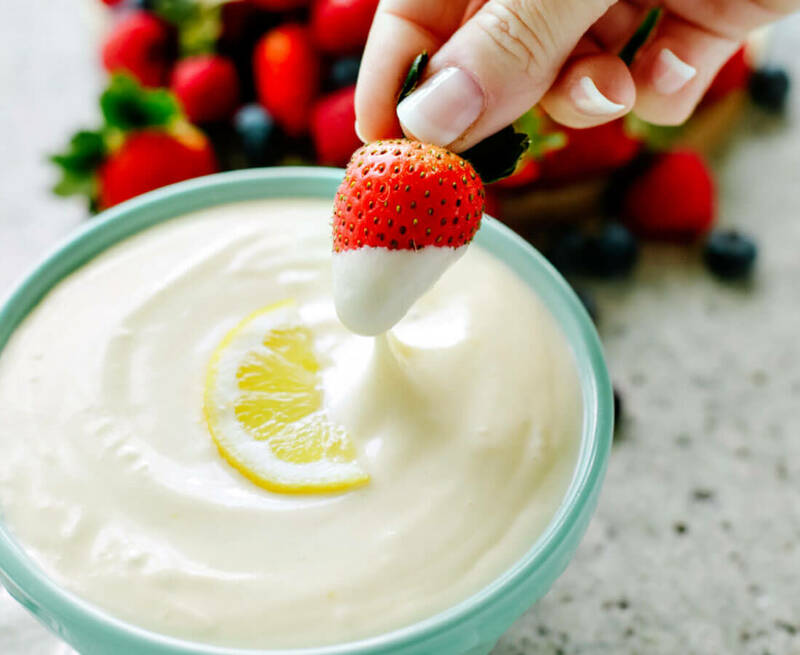 Perfectly springy and absolutely delicious, this Lemon Fruit Dip Recipe is a fresh take on a yummy dessert and/or appetizer. Going to a party? Having people over? Or just feeling like you want a midweek treat? 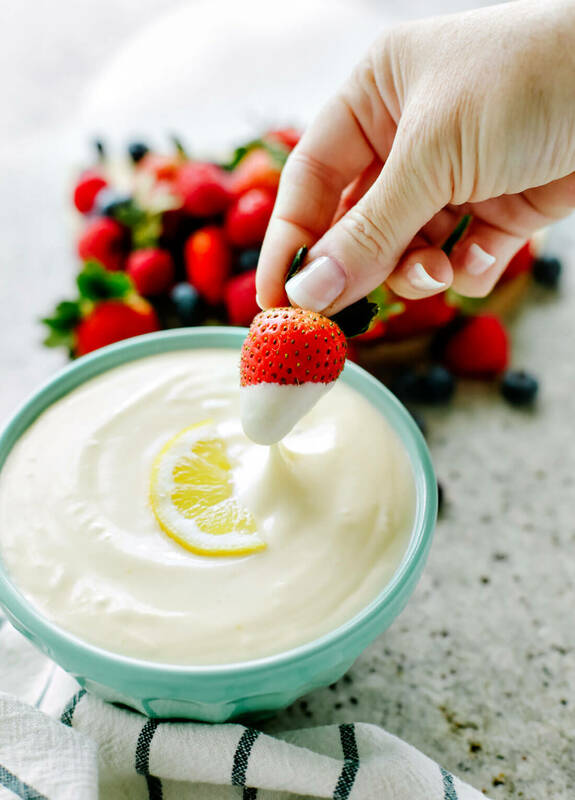 This lemon fruit dip recipe is the best best best! The creamy texture with sweet and lemon is divine. The only problem is that once you start dipping, it’s hard to stop. 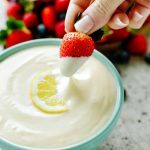 While there are lots of fruit dip recipes out there (see more of mine below), for this one you use the stove. It’s not complicated so don’t be alarmed. And it’s worth all making your own whipped cream and tempering eggs. Don’t worry, I teach you how to do these cooking basics that you can use over and over in all kinds of recipes. 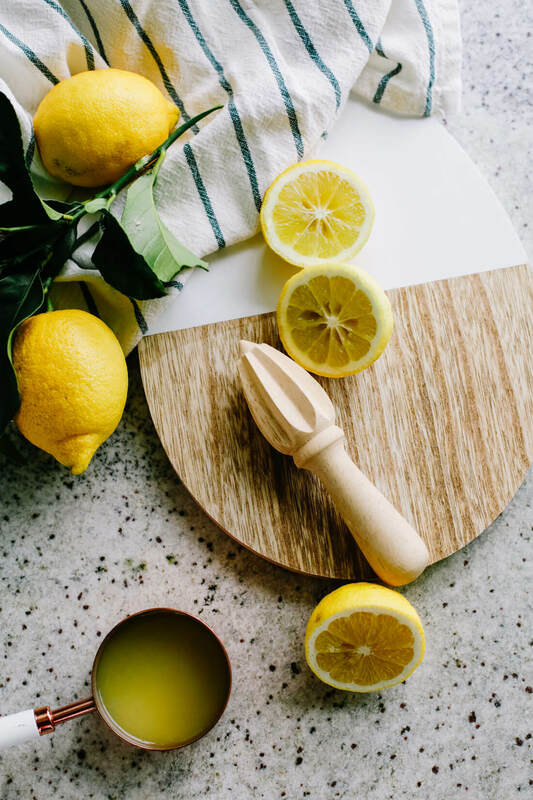 Lemon juice from concentrate can be used for this recipe, but nothing compares to freshly squeezed lemons. I was lucky enough to be at my Mom’s house with all kinds of fruit, including lots of lemons. All you need to make your own whipped cream is sugar and whipping cream (the kind that comes in a carton, found in the fridge section by the milk). It’s the best kept secret. But really it shouldn’t be. It is the easiest thing to do and the difference between homemade and store bought is incredible. To make it you need: 4 TBSP of sugar and 2 cups of whipping cream. Put a metal mixing bowl into the freezer for 10 -1 5 minutes with your beaters from your mixer (or a whisk if you do it by hand). After it’s cold, put the sugar into the mixing bowl and add the whip cream. Whip with your mixer or whisk until the cream reaches stiff peaks (about 5 minutes). *Use homemade whipping cream within the day. It’s best used and/or served immediately. You might be wondering why I have “how to temper eggs” in here when this is a fruit dip recipe post. To make sure you don’t come out with scrambled eggs (since you add egg mixture to something on the stove, it could scramble), you will want to temper them. It is a really quick process but definitely worth it to have the right consistency. Don’t be freaked out. Just do it! “Tempering” is a fancy way to say that you’re mixing two liquids with different temperatures together without changing the texture. Instead of just pouring everything into the hot mix on the stove all at once and having scrambled eggs, you will need to add a little bit of the hot mixture into the egg mixture. Take about 1/4 c of the hot mix and stir it into the bowl of egg mixture while whisking constantly. Continue to very slowly add a little bit of the hot mixture into the egg mixture while whisking and then you are ready to transfer all of the egg mixture into the hot mixture on the stove. Don’t just dump it in though. Slowly stir the egg mix into the sugary hot mix. Because you’ve added the hot liquid slowly, it will gradually bring up the temperature of the eggs without scrambling them and the texture will remain in tact. 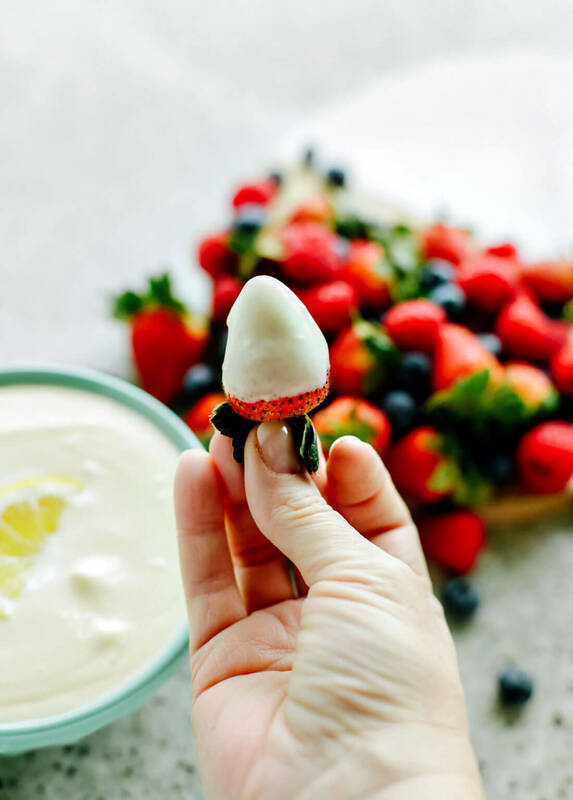 What fruit should I serve with fruit dip? Decisions, decisions. After making the dip, you’ll want to wash and clean some fruit. This is all about personal preference but I love cutting up apples and berries of all kinds with this type of dip. Anything you like can be served with fruit dip! How long will this fruit dip last? 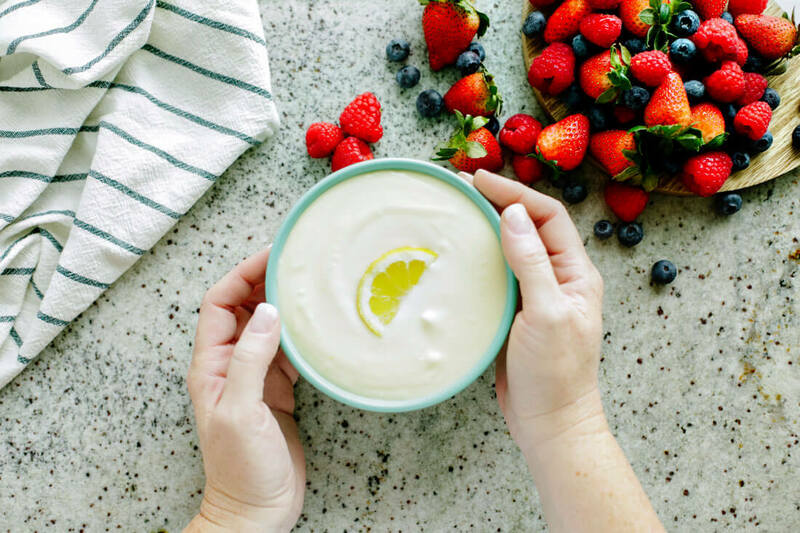 This fruit dip is so good that it probably won’t last after you make it. But IF it does, you can keep it in the refrigerator for up to three days. Make sure that it’s stored in an airtight container and stirred before serving again. Like this recipe? Then you’ll like these posts too. All of these are super easy to make and soooo good! 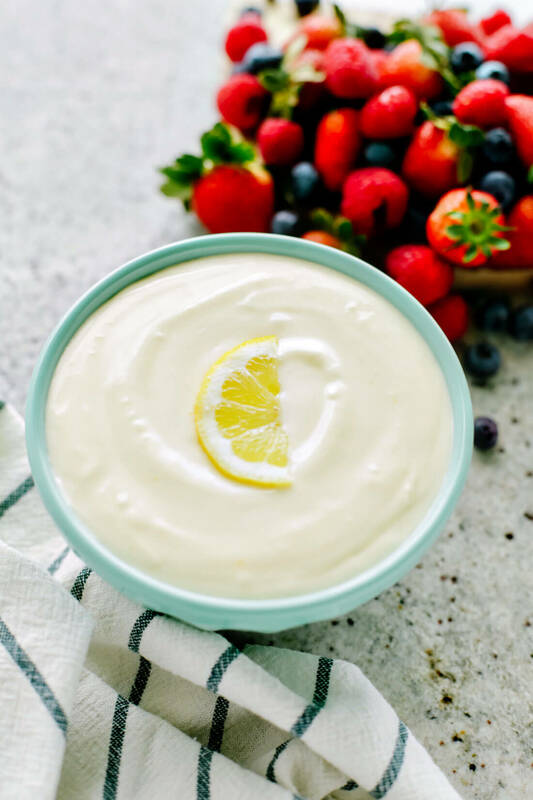 If you love this Lemon Fruit Dip Recipe as much as I do, please write a five star review, and be sure to help me share on Facebook and Pinterest! In bowl, beat together eggs, 1 C. sugar, and lemon juice. In saucepan, combine remaining sugar and cornstarch; stir in water. Cook and stir until thickened; remove from heat. Before beating in egg mixture, temper eggs. *See note of how and why to temper eggs. Gradually beat in egg mixture. Over low heat, cook and stir until slightly thickened. Serve with fresh fruit. Refrigerate.